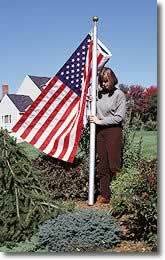 Why Choose This Telescoping Flagpole? No ropes to rot, tangle, or bang in the wind. No exposed hardware to rust or corrode. Clean, simple lines provide a professional appearance. 100% aircraft-grade aluminum is super strong, handsome and Made in America. Carries a 5-year Limited Warranty the best in the industry. Comes with a heavy-duty locking ground sleeve and double harness for flying two flags, or one flag at half mast. Comes with a FREE 3x5 American Flag! Telescopes down to 7' just as easily to attach flags or to transport the flagpole to a new location. Section lock and release at the touch of a button. Helps Eliminate Tangles! Double harness allows for two flags. Polycorbonate collars with stainless steel clips rotate 360 degrees to help prevent flags from tangling, so flags fly freely. No Ropes to Snarl or Clang! Excellent Quality/Maintenance-Free Rust-proof, aircraft quality 2-5/8" diameter 16 gauge aluminum is maintenance-free! 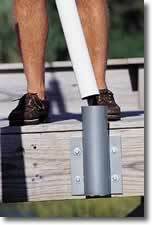 Remember to add these accessories for your telescoping flagpole! Eagle Topper: Perfect to top off your Telescoping flag pole and add some additional patriotism to your US flag display. 18" x 12" Gold 1/2" spindle thread. 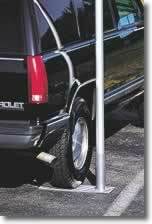 Wheel Stand: This solid aluminum wheelstand lets you take your flagpole with you and display it proudly at tailgate parties or campsites, secured under the wheels of your car, truck, Van or RV. Deck Dock Mount: If you want to install your flagpole on a deck or boat dock, or if you would like to take your flagpole with you to a vacation home and use it on a dock there, then one of our easy-to-install Boat Dock and Deck Mounts is the perfect solution. These strong, durable, solid aluminum mounts stand up to marine environments -- and they give a handsome, professional look to your installation.